We love custom painting figurines for our customers. We find it exciting because each dog is totally different from the next, which keeps it fresh. We also enjoy painting these figurines because of the customer reactions we get. We get responses that are filled with so much joy which instantly put a smile on our face. Customers reply with expressive exclamation points, smiley faces, and words of gratitude. In addition to the variability and gratitude we get to experience, we also love playing a special part of some of our customers most important days. These figurines are used on wedding cakes, birthday cakes, and on pet memorials. From celebrating one of the happiest days of their lives, or remembering a sad day year after year, these figurines represent a beloved memory and dog that will be treasured forever. Some of our figurines are more unique than others. The look of the figurine all depends on the dog’s coat and the unique story of the dog’s life. One figurine that we painted for the top of a wedding cake was adorned with an adorable blue bow tie that matched the groomsmen on the day of the wedding. Another figurine was of a German Shepherd who worked in the police force. He was a true hero-dog! The most recent custom dog figurine that we painted was of a yellow lab named Roadie. Roadie was a blind dog who died of heartache from losing his best friend. His best friend was a black lab who passed away a couple months earlier. 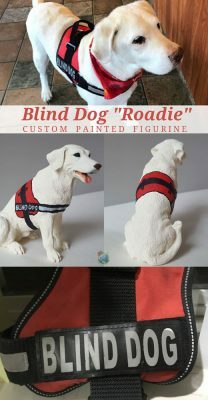 Roadie proudly wore his blind dog vest everywhere he went. When our customer requested us to paint the vest on to the figurine, we knew it would be a new and exciting challenge. We received multiple photos of Roadie wearing his vest, which helped us in fully capturing all the details of the vest and the dog. Our customer, Brad, responded with the message below after he saw the custom painted figurine of Roadie. We were so proud with how this figurine turned out. We loved playing a part in paying tribute to this adorable dog with a disability, who passed over the Rainbow Bridge. The response from Brad was the cherry on top! If you or someone you know is living with a blind dog give our living with a blind dog article a read.